At Twywell last Saturday it became obvious that my own set of watches needed replacing. The screens fading in the sunlight and the watches not always starting when the buttons were pressed. I was at the F3J meeting the next day and kept a watch out for watches. Colin Lucas had a neat set, the "normal" talking countdown timer plus two timers (one shown on the right) of a sort I had not seen before. They were from Maplins and cost me £18.48 for a pair including postage. Ordered Sunday evening, arrived Tuesday. According to the packaging "Great for Kitchen, Medications and Hair Styling". Also great for handling the count DOWN that we need for a number of F3K tasks. I have a lot of trouble reading a normal stop watch and converting this so I can speak a count down to a set time. Because the Maplin timer has a set of numeric buttons it takes only 3 easy clicks to set up and start a 15sec count down, the same for a 55sec count down, an extra click for one over a minute. 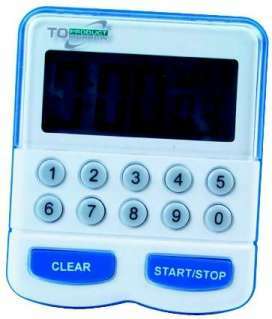 Just one click to convert back to a conventional stop watch. The large display is in hours, minutes and seconds, no fractions of a second. The timer takes an AAA battery and has clip/stand/magnet on the back that is easy to either take off or use to fix the timer to the sort of recording board we use. The Maplin device lacks the quality (or the cost) of the Seiko and Robic mentioned below but worth a try for the ability to swap easily between count up and count down, also for the fact they record whole seconds and don't give fractions of a second. 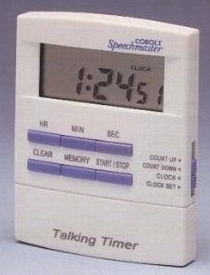 Maplin reference:- "SC67 - Direct Dial-in timer". In February 2014 they were listed as "discontinued product" but with some still available at £4.49 each. 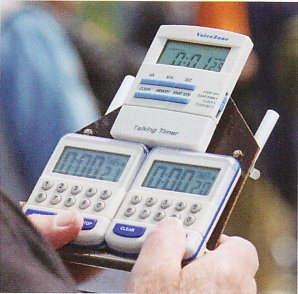 A very wide range of stop watches are used when timing for F3K but no guidance as to which is best. I was interested to read about the suggestions as to how the Robic SC 707 could be used in F3K. Thanks to Top Copp from the USA and www.f3x.com from where this information comes. - Click the 'Accessories' menu item at www.f3x.com and scroll down for details of both the watches and how to use them in either F3K or F3J competitions. Since 2005 the three watches, two Maplin ones and the talking timer have given good service, easy to read, easy to use and with the batteries replaced just once in all of them.